Designer Weddings are here to stay. We offer a fascinating range of options to take your wedding to another level. Your could either opt for a customized theme or take a pick from some of the newer options that are being developed consistently. What better than attending a wedding with a theme. This could be dictated by a colour, an era, or even centered on the venue's own style. We Organize your wedding with conceptual themes, floral arrangements, Mandap and lighting after understanding the couple's vision. There are so many different places to have a wedding , but how do you choose the perfect ceremony site and reception venue for your big day. 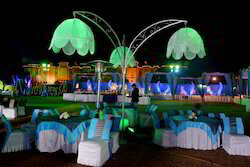 - Designed & Décor Spanish Party for Mr. Sushant Gupta in 2000. 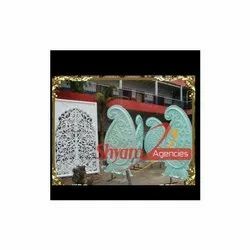 - Designed & Décor Turkish Party for Mr. Dev Mohan Gupta in 2000. - Mughal Theme for a Mujrah Party of Mr. Dev Mohan Gupta in 2001. - Ajay Jadeja’s Wedding at J & K House, New Delhi in 2001. At Ramoji Film City, families can truly celebrate the joyous occasion while we take away all the stress and burden of organising and planning. Instead of running about in a flurry of activity, the family can focus on spending quality time together with family and catching up and celebrating. CORPORATE GET TOGETHER- Break from the norm and be adventurous when planning your next charity event. Whether you are planning a workshop, a management seminar, marketing or training session, we can customise our facilities to meet your individual needs and ensure a memorable event. and commitments to one another in becoming life mates. Wedding memories become beautiful by adding a personal touch for your loved ones along with our ideas & thoughts. The ideal combination of love and fun makes the occasion a celebration!